Hemoglobin (Hgb or Hb) is a protein found in red blood cells which is required to transport oxygen throughout the body. Your blood needs hemoglobin levels to be in the normal range to provide oxygen to the cells in your body. Low hemoglobin levels result in various types of anemia which can cause symptoms like fatigue, dizziness, headaches, and shortness of breath. High levels of hemoglobin are less common and can also result in similar symptoms to low hemoglobin in the blood. Vitamin and mineral deficiencies in your diet, blood loss, thyroid disorders, and pregnancy are some of the causes of low hemoglobin levels and anemia. In order to treat abnormally low hemoglobin levels, you’ll need to know the type of anemia you have and what caused it. Very often, iron or vitamin B12 supplements help to increase hemoglobin levels in the blood. In this article, I will look at the medical reasons why hemoglobin levels in your blood can be below or above the normal range. You will also find out how to increase low hemoglobin levels with diet or by taking supplements. What Is Hemoglobin (Hgb or Hb)? Hemoglobin (Hgb or Hb) is a protein found in red blood cells that is responsible for carrying oxygen around the body. A hemoglobin test measures the levels of hemoglobin in your blood. This blood test is usually done as part of a complete blood count test which checks your red blood cell (RBC) indices. Testing for levels of hemoglobin is usually done if a person shows signs of anemia. If the hemoglobin test shows low hemoglobin levels, doctors may arrange more specific red blood cell tests to determine the exact type of anemia. Labs test results to determine high or low levels of hemoglobin measure hemoglobin level in grams per deciliter (g/dL). 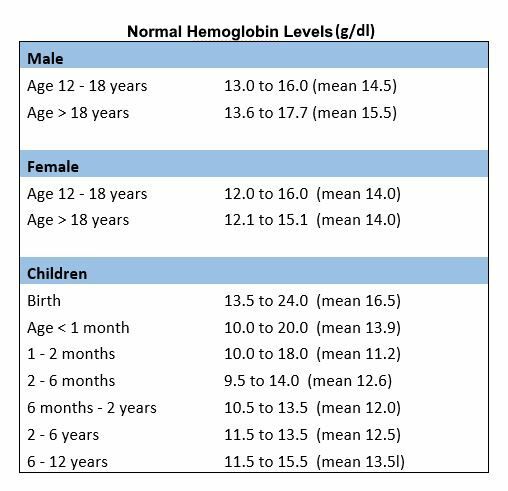 Below you can see a hemoglobin levels chart with more detailed information on the normal hemoglobin range for adults, children, and babies. Low hemoglobin count could be associated with a disease or medical condition. Low hemoglobin levels result in anemia which means that not enough oxygen is getting pumped around your body. Some people show signs of hemoglobin levels that are dangerously low. The causes of low hemoglobin that can put your life at risk could be due to heavy blood loss, RBCs getting destroyed too quickly, or major problems in your organs. The journal Critical Care reports that critically low levels of hemoglobin are generally classed as anything below 8 g/dL or 8.5 g/dL. However, some doctors say that, in some cases, the trigger point for a blood transfusion could be a low as 7.0 g/dL. Let’s look in more detail at what can be causing symptoms of anemia and your hemoglobin levels to drop below the normal range. Iron-deficiency can cause anemia which means that your hemoglobin levels are low. Anemia caused by a lack of iron is called iron deficiency anemia. It occurs when the body can’t store enough iron or when iron is lacking in the diet. Not getting enough vitamin B12 or folate in your diet can cause a type of anemia called megaloblastic anemia. Other reasons for malabsorption and a lack of vitamin B12 can be due to inflammatory bowel disorder (IBD), gastric surgery, or being infected with a tapeworm. Vitamin B12 malabsorption can lead to pernicious anemia. Vitamin D. According to scientific research published in the journal Renal Failure, a lack of vitamin D can lead to anemia and a low hemoglobin count. Vitamin D deficiencies can also cause headaches, tiredness, and back pain. Pregnancy-related anemia is very common due to a decrease in the percentage of hemoglobin molecules in red blood cells and the extra demand for iron. If there is a drop in the mean corpuscular volume (MCV) of below 80 fL, this could lead to microcytic anemia. A low hemoglobin count with high MCV (of over 100 fL) can lead to vitamin B12-deficiency anemia or folic acid deficiency anemia. Anemia during pregnancy is usually treated by taking folate and iron supplements. Low hemoglobin levels could happen because of chronic blood loss or acute blood loss. If your thyroid doesn’t function properly, you may have persistently low hemoglobin levels and symptoms of anemia. Because inflammatory bowel conditions affect the absorption of iron, diseases like ulcerative colitis and Crohn’s disease can cause a drop in hemoglobin (Hgb) levels. Rheumatoid arthritis is an autoimmune condition that can cause below normal hemoglobin levels and painful joints. It’s important to note that a vitamin D deficiency is also associated with arthritis. For more information on how to manage arthritis symptoms, please read my article on foods to eat and to avoid if you have arthritis. Your kidneys that are located in your middle back play an important role in producing enough red blood cells to carry oxygen throughout your body. If you have high blood pressure or diabetes, then you have a greater risk of developing kidney disease. It’s important to drink enough water daily to help flush toxins from your urinary system. A bacterial infection in your stomach caused by the H. pylori strain can cause stomach ulcers that can cause low hemoglobin. You can use Manuka honey as a natural antibiotic to help kill off H. pylori infections that lead to peptic ulcers. You can also check out my other great natural cures for stomach ulcers if you have these gastrointestinal sores. One of the results of getting old is showing symptoms of anemia because of low hemoglobin levels. Certain disorders of the blood can cause chronic anemia because it’s difficult for hemoglobin levels to rise in order to be within the normal range. Cancer. Various types of cancer can destroy red blood cells and cause dangerously low hemoglobin levels. Also, if cancer affects the internal organs like the pancreas, liver or kidneys, this can result in anemia due to low iron levels. What is the best way to treat low hemoglobin and raise levels to be within the normal range? In most cases, successfully treating anemia means diagnosing the type of anemia and addressing the underlying issues. If you are diagnosed with iron-deficiency anemia, then your doctor may recommend a course of iron supplements to boost Hgb in your blood. To help address iron-deficiency anemia, doctors may also recommend taking folate along with iron supplements. It is also possible to raise hemoglobin levels to normal by including in your diet foods that are rich in vitamin B-12, folic acid, and iron. A low hemoglobin diet should also focus on increasing iron absorption in the body. The most common cause of having raised levels of hemoglobin that isn’t a result of a medical condition is living at high altitudes. What else should you know about hemoglobin and what questions do many people have regarding what to do when hemoglobin is low? Can I test for low hemoglobin levels at home? Are there side effects when taking iron supplements to boost hemoglobin? If you have any of the above side effects from iron supplements, you should speak with your doctor. What are the signs and symptoms of taking too much iron? You should seek emergency care if you or a child has swallowed too many iron supplement pills. This ideal reference range of hemoglobin A1c (glycated hemoglobin) is between 4.8% and 5.9%. However, anything less than 7.0% should be acceptable for people with diabetes.